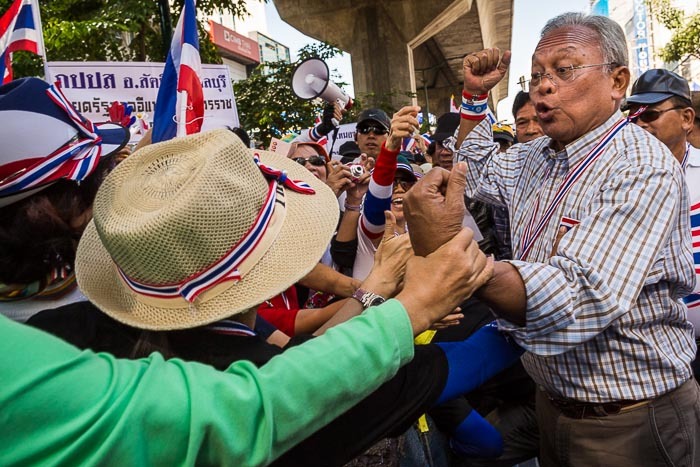 Anti-government protest leader Suthep Thaugsuban is mobbed by supporters during a walk up Sukhumvit Road to the Ekkamai neighborhood Wednesday. Anti-government protest leaders promised to shutdown Bangkok and they did. Groups of protestors fanned out across central Bangkok Sunday night and "seized" key intersections. They put up roadblocks and built stages. Mini-cities popped up in minutes. They say they seized the intersections but the government of Yingluck Shinawatra made no effort to stop or hinder them so the seizures were pretty easily accomplished. Seven of the busiest intersections in Bangkok are shutdown to traffic. Protestors are camped out in the street and huge stages provide entertainment and a venue for speech making against the government. At this point, it all resembles a street fair. Vendors and food stalls have popped up and people are strolling down the middle of city streets that are normally packed with cars. Suthep, the firebrand protest leader, visits the stages to make speeches and lead marches through the neighborhoods. The marches inevitably turn into a money making procession as anti-government activists line up to press thousands of Baht into Suthep's hands. The protests also, at least for me, highlight Bangkok's diversity. At the main stage in the Pathum Wan intersection (near MBK shopping center) there were three religious services at the start of the day Wednesday. Buddhist monks participated in a merit making ceremony, then Muslim imams led a prayer and that was followed by a Catholic priest and nuns leading a Christian prayer. The Christian service ended with the singing of "Amazing Grace." 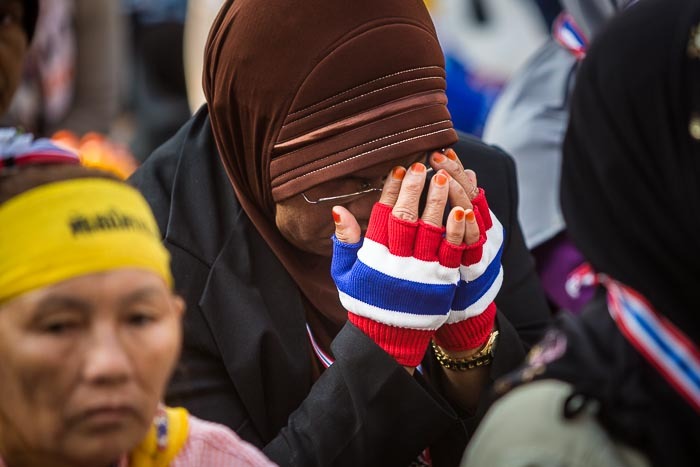 A Thai Muslim woman prays Wednesday morning in front of the Pathum Wan stage. The protest leaders have vowed to continue until the "caretaker" Prime Minister resigns. She's said repeatedly she's not going to step down and has urged the protestors, if they don't like her, to vote her out of office in the coming election. Despite the huge number of protestors on the street, they represent a minority of Thailand's voting population and simply don't have the numbers to vote the PM out. The election is February 2. A little over two weeks away. It doesn't feel like an election is only two weeks off. There's very little campaigning going on in Bangkok, unless you consider the protests a form of electioneering. In that case campaigning is non-stop. The protestors are boycotting the election though and have vowed to disrupt it, so I'm not sure that counts. There have been isolated incidents of violence around the edges of the protest areas but so far it's been more peaceful than a lot of people (including me) expected. The Red Shirts, who support the government and led the violent 2010 protests, have been very restrained. They've held small rallies in the provinces north of Bangkok but they've stayed away from the capital because they don't want provoke violence with the anti-government protestors. There are more photos of Shutdown Bangkok in my archive or available from ZUMA Press.